Target has blessed me again with their wedge sandals! This week, this particular shoe is on sale this week for $19.99! Sale ends tomorrow, so act fast! This week, this particular shoe is on sale for $23.99. Again, the sale ends tomorrow, so act fast! One other great thing is, this week Target has a coupon: $5 off Apparel and/or accessories purchase of $25 or more. Get thee to Target, expeditiously! I missed out on using the coupon, but I have the Red Card, so I still saved! This entry was posted in Fashion, Sandals, Shopping, Target. Bookmark the permalink. 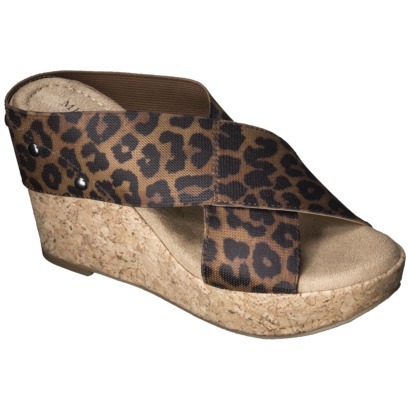 I’m loving these cute wedges and I have a $5 Target gift card. I’m heading over there tonight. Yaas! They are too cute to pass up! I get lucky there every year!